Please refer to our stock # EG338 when inquiring. Consolidated Glass Company produced the Catalonian line in 1927. It was made to look like glass found in Catalonia Spain at the archaeological sites, and had bubbles and raised rings blown into the glass. This is the 1154 sweet pea vase - part of the Spanish Knobs variation - done in a rare color treatment. 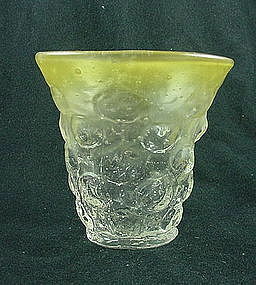 The vase is crystal with honey yellow ceramic wash at the top edge. This treatment is often referred to as 'rainbow' due to the bands of color. The vase is approximately 4 1/2 inches high and in perfect condition. I have 2 available, price is per vase. I have other items in this pattern available, just ask.